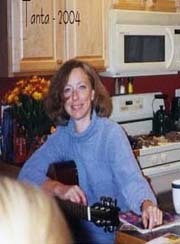 Treasuries plunged as the government sold a record $30 billion of five-year notes at a higher yield than forecast, indicating weak demand. The 10-year yield is at 2.82% today, well above the record low of 2.07% set on Dec 18th. 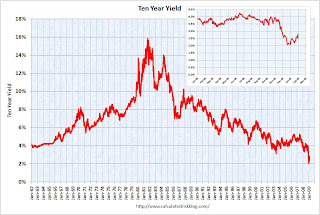 This graph shows the 10 year yield since 1962. The smaller graph shows the ten year yield since the start of 2008. In the bigger scheme, this has been a fairly small rebound in yield. The yield on 3 month treasuries has risen to 0.22%. I guess that means less fear than a yield of zero! The three month LIBOR has decreased to 1.17%. The three-month LIBOR rate peaked (for this cycle) at 4.81875% on Oct. 10. (improved) Imagine all those adjusted rate mortgage loans tied to treasuries or even the 3 month LIBOR? Those rates are looking pretty good. The TED spread was stuck above 2.0 for some time. The peak was 4.63 on Oct 10th. The TED spread has finally moved below 1.0, although a normal spread is around 0.5. The A2P2 spread as at 2.10. The spread has moved up slightly in recent days, but this spread has seen a huge decline in 2009. This is far lower than the record (for this cycle) of 5.86 after Thanksgiving, but still way too high. (improved). This is the spread between high and low quality 30 day nonfinancial commercial paper. Right now quality 30 day nonfinancial paper is yielding close to zero. If the credit crisis eases, I'd expect a significant further decline in this spread - although this is good progress. The Federal Reserve assets decreased to $1.93 trillion this week from a high of over $2.3 trillion in December. 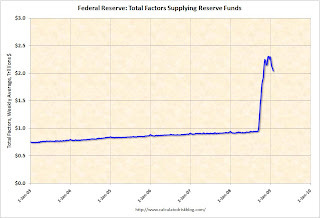 Note: the graph shows Total Factors Supplying Federal Reserve Funds and is an available series that is close to assets. Corporate borrowing in the commercial paper market shrank the most on record as companies sold less 90- day debt to the Federal Reserve. U.S. commercial paper outstanding fell $98.8 billion, or 5.9 percent, to a seasonally adjusted $1.59 trillion during the week ended Jan. 28, the Fed said today in Washington. Financial issuance accounted for almost all of the drop, falling $93.5 billion, or 12.7 percent, to $641.8 billion. The decline in the commercial paper market signals improved conditions as financial companies find other funding sources such as government-backed corporate bonds, Tony Crescenzi, chief bond- market strategist at Miller Tabak & Co. in New York, said in a note to clients today. By these indicators, the Fed is making progress.